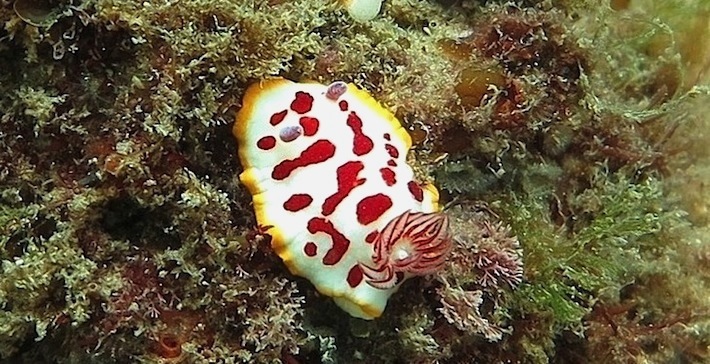 Some of the most unreasonably beautiful things under the sea are nudibranchs. 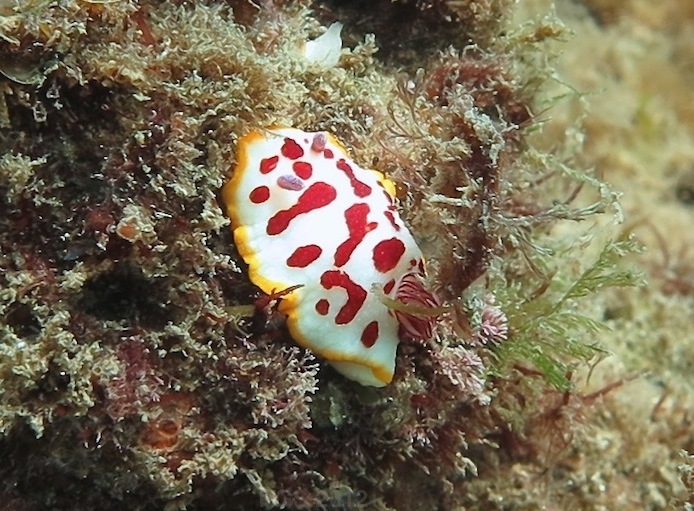 Nudibranchs are a kind of “sea slug.” I came across the red-and-white one last week, in Sydney. I am pretty sure this species is the well-named Chromodoris splendida, though I am new to nudibranchs and there are many, many species. 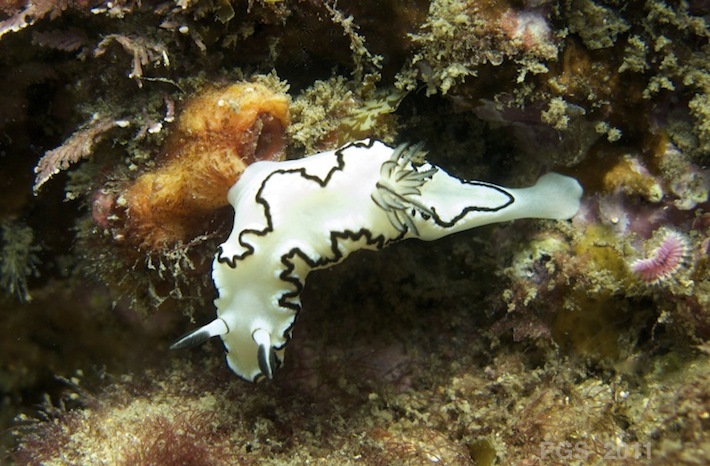 The elegant white-and-black one, also seen in Sydney, is Doriprismatica atromarginata. 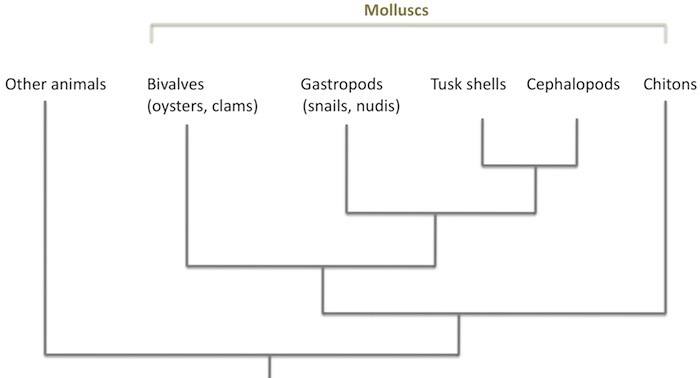 As the chart (simplified from here) suggests, gastropods are fairly closely related to cephalopods. 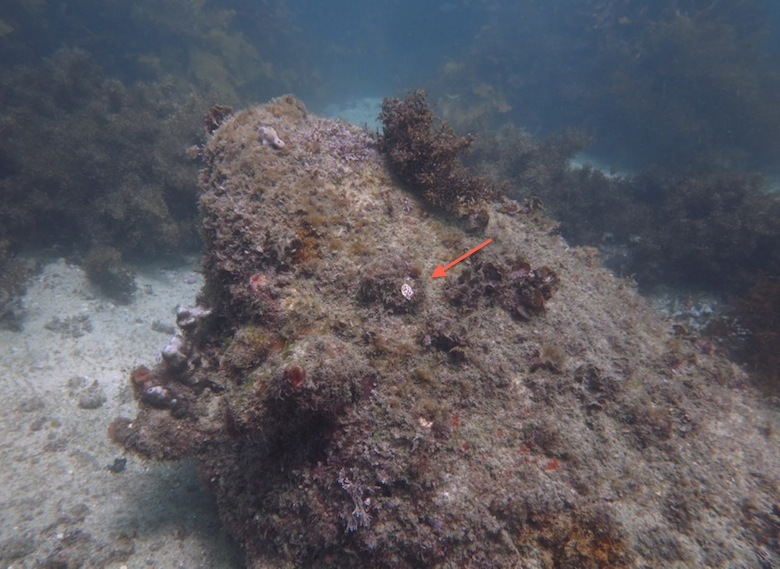 But though they are close in comparative terms, the date of the split between these two groups is deep in the history of animals, perhaps 550 million years or so ago, in the Cambrian period or even before. The two antennae on the front (left here) contain chemical-sensing organs. The head also contains tiny eyes, not visible in the picture. They look like a pretty basic bilaterally symmetrical animal, with left and right, top and bottom, and sensors at the front. Their nervous system is much simpler than a cephalopod’s, but I guess they are still mobile animals by molluscan standards, quite invested in the business of perceiving and moving around the world. Why are they so beautifully colored? They are announcing their inedibility. 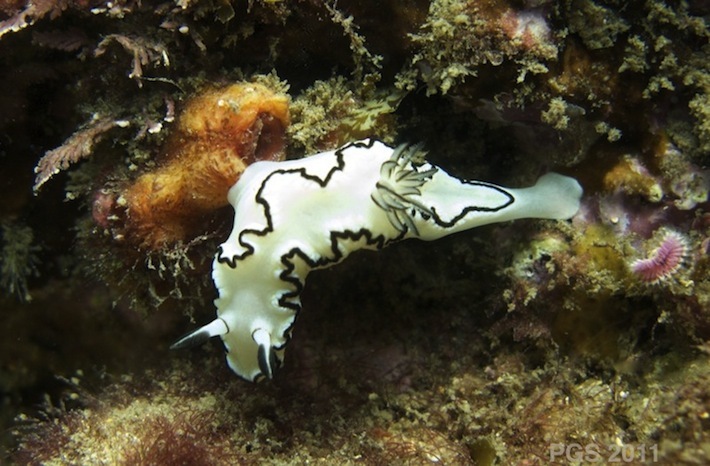 Nudibranchs accumulate toxic substances, in some cases from what they eat and in some cases by making the chemicals themselves. Predators avoid them. The evolution of this arrangement raises some puzzles, and the literature I’ve looked at so far is cautious about how it all works. The main puzzle is how the bright coloration can initially become established. The first individuals in a species to be brightly colored will be very conspicuous. Whether they are toxic or not, they will be more easily seen by predators. A predator might become sick, or die, from eating the brightly colored mutant, but that does not do the colored individual any good. If the predators could learn to avoid the colors, there would be an advantage. But that will only happen when the brightly colored form is reasonably common, and seems to be no way for it to reach that stage. The problem is more difficult if there is a cost to storing the toxins. Here is one sequence by which things might work. Mutation produces individuals with the ability to safely eat poisonous animals (a coral or sponge, for example) and retain their toxins. A change to coloration is a chemical byproduct of this new ability. It makes the animal more conspicuous to its own predators, but the benefits of the new food source outweigh the costs. Once colorful and toxic individuals are common, predators benefit from avoiding them. This might involve learning, if the poison is not fatal, or just the appearance of a new mutation making the predator wary of the colors. (The mutation arises by accident, for no particular reason, but is favored once it has arisen.) From that point, further mutations to the toxic prey animal could be favored that make the colors and patterns more striking. The result is something that deserves a name like splendida, ornatissima, magnificum, or mirabilis. The result may also include the opportunity for mimicry – for animals with no toxic defences to bluff their way past predators with the aid of similar colors. This is famous in butterflies, and I read that it occurs in nudibranchs too. More exactly, in Batesian mimicry, a non-toxic species imitates a toxic one; in Müllerian mimicry, the mimic is also toxic, and individuals of both species benefit because it is easier for predators to pick up on the association between the coloration and the defences. Batesian mimicry is a kind of deception; Mullerian mimicry is not. There is a spectrum between these two, however, as a mimic might have some chemical defenses, but weaker toxins than the “model” species. The nudibranch I saw last week, if it was indeed Chromodoris splendida, is thought to have a number of mimics. They are all Chromodoris species and, according to the website linked above, they all store toxic chemicals in that yellow fringe. So these would be Müllerian mimics – or perhaps “mimicry” is the wrong concept in this case. If they are all closely related, and something like the red and white pattern was the “ancestral” state for this group (present in their common ancestor), then it is more like an unusual case of “stabilizing selection,” working in several species at once and keeping everyone’s appearance similar. 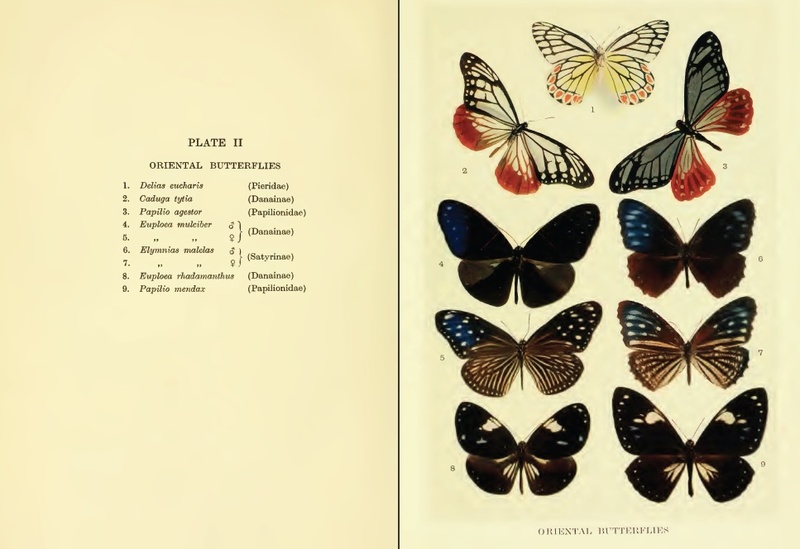 Onto dry land for a brief moment: a plate from Reginald Punnett’s beautiful 1915 book Mimicry in Butterflies. 1. “Mobile by molluscan standards”: Watching a scallop swim for the first time was one of the most startling experiences I’ve had under water. A swimming shellfish with eyes. 2. 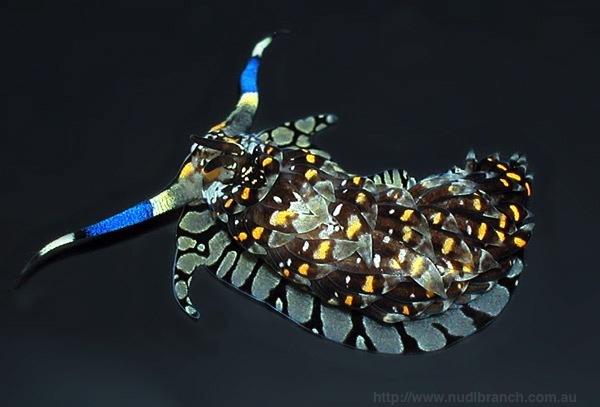 The nudibranch picture on the dark background is from nudibranch.com.au and was taken by Gary Cobb. 3. Punnett’s book has a place in the history of biology that goes beyond the butterflies. As a short Appendix he published a chart prepared by his colleague H.T. Norton, who worked out the rates at which genes with slight reproductive advantages could become established in a species. This was an early model of a kind that later became central to evolutionary biology, with the work of R.A. Fisher, J.B.S. Haldane, and Sewall Wright.